"...I do not venture near the water during the Labor Day weekend; simply too crowded, most especially the LT. Flows on the LT were recently ramped-up to 179 cfs; a nice flow IMO. The six-week PMD hatch has faded; although there are still a few emerging along with other mayflies and a few caddis (...to size 10!). If you see a consistent riser, target it, but they are really selective. Alternately, use a dry dropper rig in the riffles and deeper slots. Use an indo-rig in the deeper pools. No numbers but really healthy trout netted. 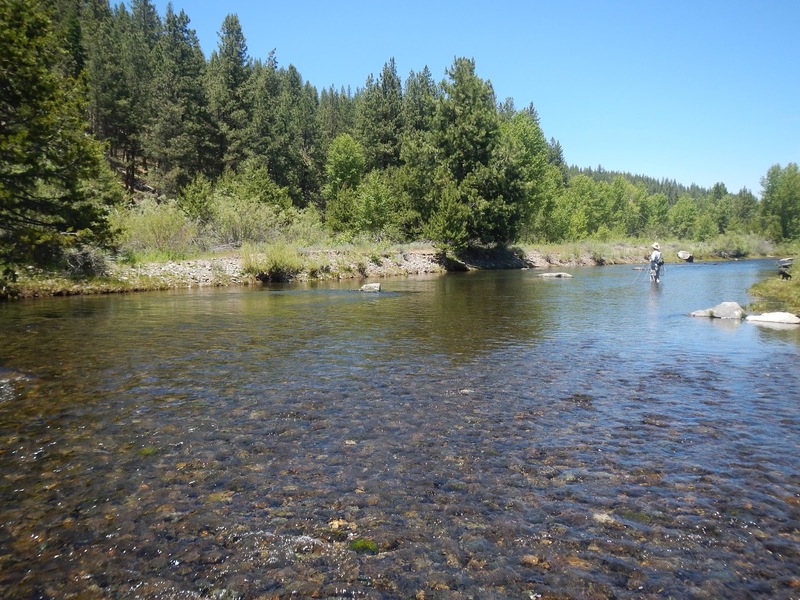 Best fish during the PMD hatch was a taped 21" Brown that ate a #16 PMD emerger and two Rainbows taped at 20"; one ate a dryfly #12 "Flav" (Little Western Green Drake) and the other a # 14 Zub-Bug on a dry/dropper set-up." 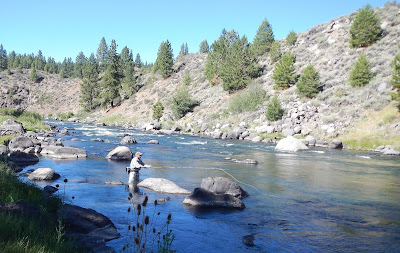 For whatever reasons the Federal Water Master had tamped-down the spigot into the Truckee River at Tahoe City starting August 5th from 250cfs to 70cfs! With all the water received this record winter of 2016-'17; I'd predicted great flows on the BT August through September...eliminating the "Dog Days of Summer". This unanticipated ramp-down lasted for a several days. Now the flows out of Tahoe City are at 230 cfs...BUT...34% below the historical 350 cfs.. I have no idea what the Feds are thinking. The current "up-side" is that flows along Glenshire Drive through Farad in the "Grand Canyon of the Truckee" are above historical average flows. This fact mitigates the severe ramp-down from Tahoe City earlier in the month. As for the BT water temps can still be an issue. I'm suggesting once you get a water temp of 66 think about leaving the water relative to potential stressing of the trout. HINT: 1) Do remember there will be a couple of degrees differential below each reservoir inflow (Prosser & Boca) and 2) Look for the cooler water emanating from the spring seepages; trout will congregate below them. We've been fishing in the AM's and at dusk. Early in the day we're probing pocket water with dry/dropper rigs; for smallish RainBows and Browns. In the deeper runs and heads of pool spill-ins use indo-rigs or tight-lining. First-hand-wise or guided angling-wise there have been no bragging-size trout. 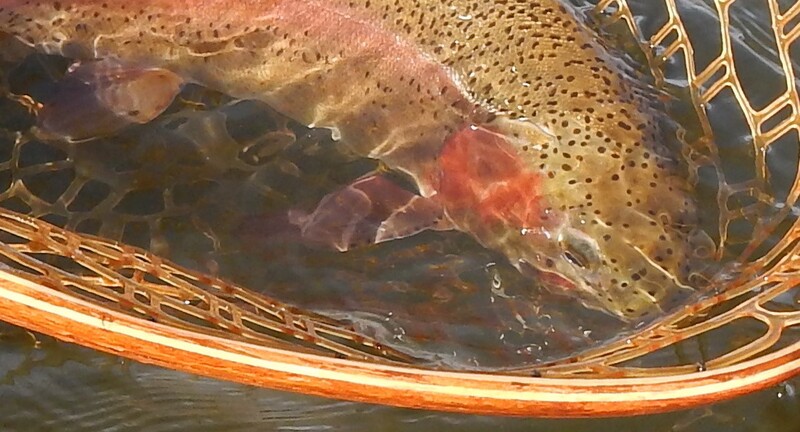 As for the LT, water temps are not an issue; being a tailwater. Nice flows at 120 cfs. PMD hatch has faded after a progressively, later-in-the-day, prime-time emergence period. Now we're observing a scattering of mayflies and caddis during the day. Best times seems to be in the early AM's and PM's. The Little Western Green Drake (Flavelina) is present in the late afternoon. Matter of fact a 20" RainBow was fooled by a #12 traditional, "Catskill" Flav tye last Friday. 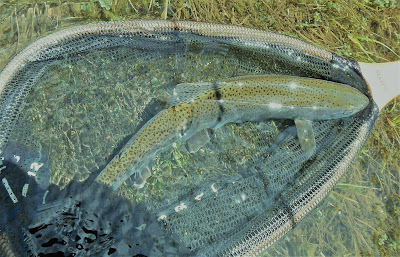 During the six-week PMD emergence RB's to 19" and a hefty-lady 21" Brown ate emergers at the surface. Those who know me know how techno-challenged I am. Yeah, stuck in my "old-school" ways and/or unwilling to learn 21st century communication....actually a composite of both. Techies, can be unforgiving and sometimes condescending...the latter which irks me because they display their intolerance and disrespect of their elders. Do I really want to be constantly "connected"? No I do not. I want to disassociate myself from instantaneous communication. Such an attitude can adversely effect my fly fishing business; such as prospective clients assuming I text...I do not. Such will remain my current operative communication; unless someone can provide overwhelming reason/s why I should change. My personal privacy remains an overriding priority.